DragonCon, one of the best fantasy and science fiction events in the world, concluded Monday in Atlanta, Georgia and while concluded, it will not be forgotten. The convention, that gathers fans from the far reaches of the globe, is likely the last one before filming begins on Guillermo del Toro’s “The Hobbit,” and discussion and anticipation for the forthcoming pair of films adapting J.R.R. Tolkien’s book was a definite part of the landscape of the annual convention. But perhaps more important to the Tolkien community was the presence of Mel “Fiver” at the convention despite her battle against ALS, often known as Lou Gehrig’s Disease. She has been a leader in the Atlanta community for a decade, helping fan in their personal lives and also bringing costumers together, often in the Arms of Middle-earth group. 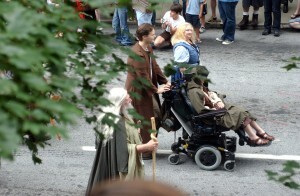 From her wheelchair, she led the group in the DragonCon parade, which featured many many different themes and costumes. Many in the crowd seemed to know the significance of the AOM group in the parade. Mel is a beloved figure and received a heart-felt tribute at the annual “Evening at Bree,” event that featured costumes and dancing with Craig Parker speaking from the stage. (Editor’s note: Sorry about the photo, my camera battery suddenly gave out just as the Tolkien costumes entered my limited field of sight. I changed fast but missed a few crucial moments). Emerald Rose played that celebration and participated in many other events all over the convention including the final day’s “Dead Dogs,” party for those who stayed over on Monday. The band, a longtime TORn friend, also has released its new CD. TheOneRing.net delivered one panel twice during the event, taking an unauthorized look at everything known about “The Hobbit,” movies so far. Hundreds of fans participated with applause for things they were excited to know about and supported their own choices for the highly discussed internet topic of who will play Bilbo in the films. (Martin Freeman received the biggest applause by the way.) Staffers Deej, Greendragon and MrCere delivered the presentation that included video from message board user (and director) Guillermo del Toro and from some of the guys at Weta Workshop. Fans were ecstatic to receive word from New Zealand even though the videos couldn’t reveal anything about the two films which as far as anybody knows, still doesn’t have a green light. A big thanks to del Toro and Weta’s Daniel Falconer, Gareth McGhie and Matt Appleton. Sideshow Collectibles and Badali Jewelry helped TORn put awesome door prizes in the hands of fans by providing giveaways. Sideshow donated three LOTR items that wowed the crowds all weekend. Lucky panel attendees walked with a Legolas Legendary Scale Bust, a Gandalf vs. Balrog diorama and a Exclusive Edition of the Uruk-Hai Berserker. The items drew gawks and awe at the TORn fan table where we featured our new t-shirts and met with fans to discuss LOTR and ‘The Hobbit’. Arjan Kiel produced music and video that helped introduce TORn and a lot of art work from some of the concept artists that have taken pass at some designs in the film such as Mike Mignola and Wayne Barlow.